Until recently, I had a hate relationship with beans. Any bean accompanying a dish I ordered would be passed on to someone else, usually Paul. If there was an option to sub it with something else, I would gladly take advantage of it. And beans as a dessert? I’ve tried (and retried) eating it in many Asian dishes and quickly discovered that I was not a fan. But used as a dip, it is something entirely different. 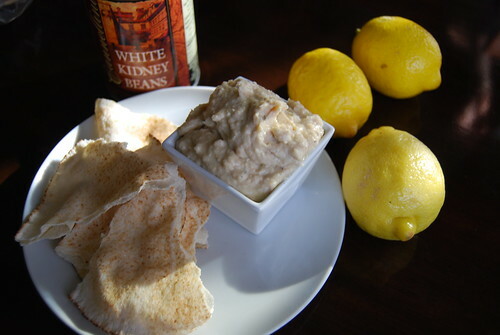 The dip that did it for me is this white bean dip using canned cannellini beans aka white kidney beans. The beans are pureed with garlic with lemon juice and olive oil, with salt and pepper added to taste. It’s extremely easy to create, but more importantly, eating it doesn’t remind me of beans at all. And no — ahem — beanie side effects either. The addition of raw garlic and a squeeze of fresh lemon juice gives it a slight burn to add to the smooth, mild taste of the beans. It can be made far in advance and it’s best served chilled with some torn pita bread. It’s become my go-to lunch at work during these hot summer days. In a food processor, add beans and garlic and pulse until lightly pureed. Add lemon juice and olive oil and puree until smooth. Add salt and pepper to taste. Add more lemon juice if needed. I love bean dip too. It’s a good idea to roast a head of garlic (if you have the time) and add that instead. Or to fry up some diced onion and stir that in after you’ve pureed the beans. I don’t like eating beans either but your recipe has me interested! Nice! Do you cook the eggplant before adding it? I love the idea of eating it with sliced cucumbers. Thanks for the idea! I’m not a fan of beans, either! 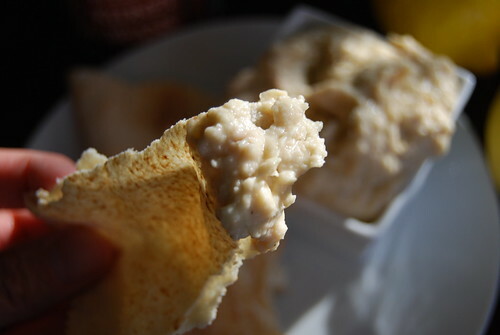 But I did have a really delicious bean dip-like appetizer at Isola in Little Italy and it used cannellini beans as well! Maybe cannellini are just magic beans. I’ll have to try this sometime and see if I can recreate something similar at home. I had one cannellini bean before putting into a food processor to make the dip and it’s really quite mild and not chalky at all. I’ll have to check out Isola’s bean dip.